I ordered the shell just over a year ago when the SNES design first appeared, and got the matching screen lens about 6 months ago. I found a cheap GBA at a local retro toy fair last month. The most expensive part was the screen; they were half the price last year. The rumor is that the screens are no longer being produced, pushing up the prices, but I wonder if Donald Golf’s trade war is contributing to the inflating cost. Cutting the shell to size was easy enough. Many sites recommend a Dremel instead of a X-acto knife, but I found that the plastic used in the reproduction shell was soft enough to make cutting through it fairly easy. At one point the knife snapped in half, pinging a razor-sharp chunk of blade across my desk, but fortunately the half-blade was better suited to slicing up the plastic than the pointed tip had been. The first time I put the GBA together I didn’t bother soldering the wire. A few online guides suggest that this is optional if you don’t mind a dimmer display. 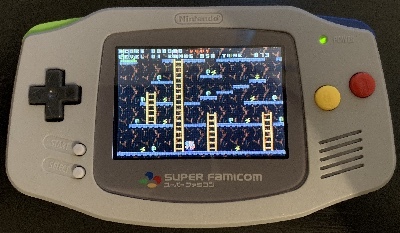 Having used other modded GBAs I thought that the dim screen was disappointing, so I decided to open it back up and solder it. This was the part that concerned me: I don’t mind ruining a cheap reproduction shell, but I really didn’t want to damage a GBA motherboard. I haven’t done any soldering in years and never anything as fine as required here. Surprisingly this part of the mod also went smoothly and I got the wire soldered on my first attempt. Insulating the soldered wire from other components around it. With all of this done I loosely screwed the GBA together and gave it a try. It worked! I screwed it together properly. It didn’t work. I unscrewed it a little. It worked! Hmm. If I squeezed the bottom of the GBA the screen switched off. Looking closely, it seemed that the screen was still working but the backlight was off. Time to unscrew it fully and figure out what’s going on. Some diagnosis later - disassembling everything I’d just put together, including removing the soldered wire - I found that there was a tiny rip in the ribbon cable that connects the screen to the adapter. This cable is part of the screen and cannot be replaced. Any damage to the cable means the screen is dead. I have no idea where the rip came from, but now I needed a new screen. Remember that I said the screen was the most expensive component in the mod? Another $78, another week, and finally a new screen arrived. In the meantime I’d re-soldered the adapter cable’s wire; of course it detached again whilst I was working on the GBA so I had to solder it a third time. Each solder was messier than the last, but I somehow avoided damaging the motherboard. This time there were no rips and I got the GBA assembled. I didn’t bother taping up the screen with electrical tape as I’d subsequently heard that it doesn’t look that great. The last piece was the Famicom-style screen lens. The lens came with glue already in place. All I had to do was peel the backing off the lens, ensure the screen and lens were clean, and stick it down. After checking both surfaces and sticking the lens down I switched the GBA on to discover that there was now some sticky goop between the lens and the screen. I have no idea how that got there. One quick complete disassembly, clean and reassembly later and I had a fully modded GBA. 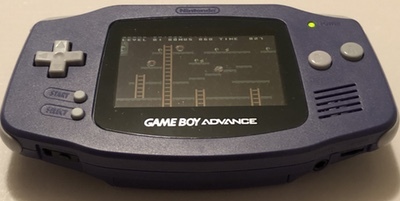 You can definitely buy a pre-modded GBA for considerably less than the price of the individual components if you damage your first screen and have to buy another. I should stick to software. Open the ROM with mGBA. Open the mGBA debug server UI (in macOS, open Tools -> Start GDB server…). Using the default options (port 2345 and address 0.0.0.0), hit “Start”. Open up a terminal and run /opt/devkitpro/devkitARM/bin/arm-none-eabi-gdb to start GDB. In GDB, enter target remote localhost:2345 to connect to mGBA. Enter file <path_to_elf>, replacing <path_to_elf> with the full path to the .elf file that should have been created alongside your ROM. When asked if you want to change the file, enter y and hit Return. 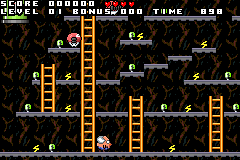 Now you should be connected to mGBA, with symbols loaded, ready to start debugging.